(8 p.m. EDT) -- Four cruise ships have been forced to alter their Mexican Riviera itineraries due to Hurricane Willa, a category 4 hurricane swirling off of the southwestern coast of Mexico. According to a statement from Regent Seven Seas Cruises, Seven Seas Mariner is spending a day at sea today, October 23, rather than stopping in Cabo San Lucas a scheduled "for the safety and comfort of our guests and crew." Norwegian Pearl, which is currently sailing a chartered cruises, is also spending the day at sea rather than call on Cabo "to avoid any impacts from Hurricane Willa." Earlier this week Norwegian Cruise Line announced that Norwegian Bliss' October 20 sailing -- a seven-night voyage roundtrip from Los Angeles -- will call on San Francisco on Monday, San Diego on Wednesday and Ensenada on Thursday instead of Puerto Vallarta, Mazatlan and Cabo San Lucas on Tuesday, Wednesday and Thursday, respectively. The ship spent Sunday at sea and will do the same on Tuesday and Friday, returning to Los Angeles on Saturday as originally scheduled. Members on the Cruise Critic message boards have also said that Holland America's Eurodam has switched up its seven-night October 21 itinerary. The line has confirmed that instead of its original schedule, the ship will now visit San Francisco, Los Angeles, Avalon and Ensenada before returning to San Diego on Sunday as planned. Grand Princess and Disney Wonder are also sailing in the area. We've reached out to both lines, but we have not yet received word of any changes for those ships. 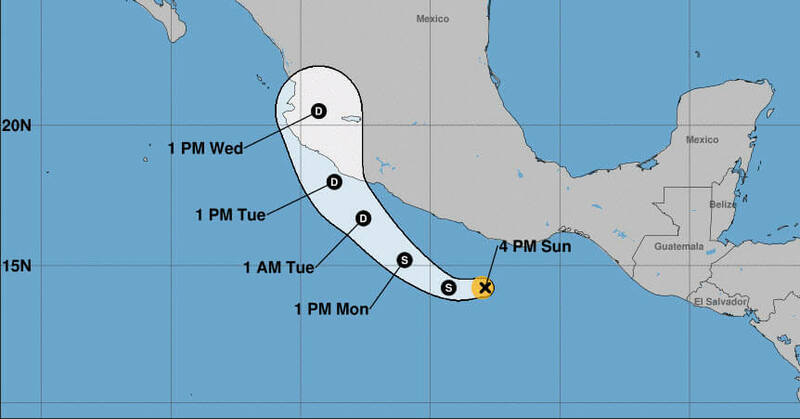 According to the National Hurricane Center, Willa is moving to the north-northwest and is expected to strengthen further before reaching southwestern and west-central Mexico on Tuesday. It's currently about 150 miles south-southwest of Mazatlan, Mexico, and has maximum sustained winds of up to 130 miles per hour. The Mexican government has issued various watches and warnings, including a hurricane watch from San Blas to Mazatlan, a tropical storm warning from Playa Perula to San Blas and a tropical storm watch from north of Mazatlan to Bahia Tempehuaya. A warning means conditions are expected in the area within 36 hours, while a watch means they're possible within 48 hours.